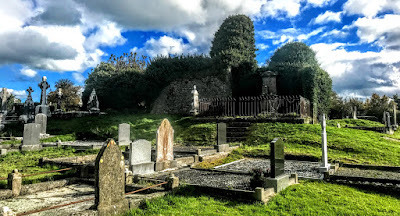 The Church of Ireland parish church in Newcastle West, Co Limerick, once stood between the Desmond Castle and the Main Square, and was built in 1777 at the sole expense of the local landlord, William Courtenay (1742-1788), 2nd Viscount Courtenay, de jure 7th Earl of Devon, and a cousin of Henry Reginald Courtenay (1741-1803), Bishop of Bristol (1794-1797) and later Bishop of Exeter (1797-1803), father of the 10th Earl of Devon. As the local landlords in Newcastle West, the Courtenay family were benign patrons of the church, building both the Church of Ireland and the Roman Catholic parish churches, and this patronage is reflected in the names of streets in the town, including Bishop Street and Church Street. However, Saint Thomas’s Church in the square fell into disrepair, and was demolished over half a century ago, in 1962. Today, the site of the church is now marked out by low-level walls, and here too is a bronze figure representing Gerald FitzGerald, 3rd Earl of Desmond. The Limerick historian and antiquarian, Thomas Johnson Westropp (1860-1922), says a church in Newcastle West was destroyed in a war in 1302. A later church in Newcastle West was dedicated to Saint David on Saint David’s Day, 1 March 1410, perhaps in deference to the origins in Wales of many of the Anglo-Normans, including the FitzGerald family of Desmond. This church may have been replaced in turn by the church in Churchtown that O’Donovan said was built in 1690. This church was abandoned when Saint Thomas’s was built in 1777, closer to the new town being laid out by the Courtenay family and closer to the castle. After the new church was built, the glebe land was still held by the Church of Ireland rector and later by the Revd Horatio Bolton Smith of Castle View. Saint David’s stood on the edge of the Castle Demesne, and by 1840 it was in ruins. When I was in Newcastle West at the weekend, I walked around the old graveyard in Churchtown, which was enclosed and gated in the 19th century, and the church ruins. The ruins of Saint David’s Church are surrounded by this graveyard covering about 4 acres. The graveyard is still in use today and holds the graves of local Church of Ireland and Roman Catholic families, with the older graves encircling the church ruins in the centre of the graveyard. Only the west end of church now stands, consisting of the west gable, the west end of the north wall, and the west end of the south wall. The walls stand to full height apart from the south wall, most of which has been reduced to a few courses. The church was built of random rubble limestone. 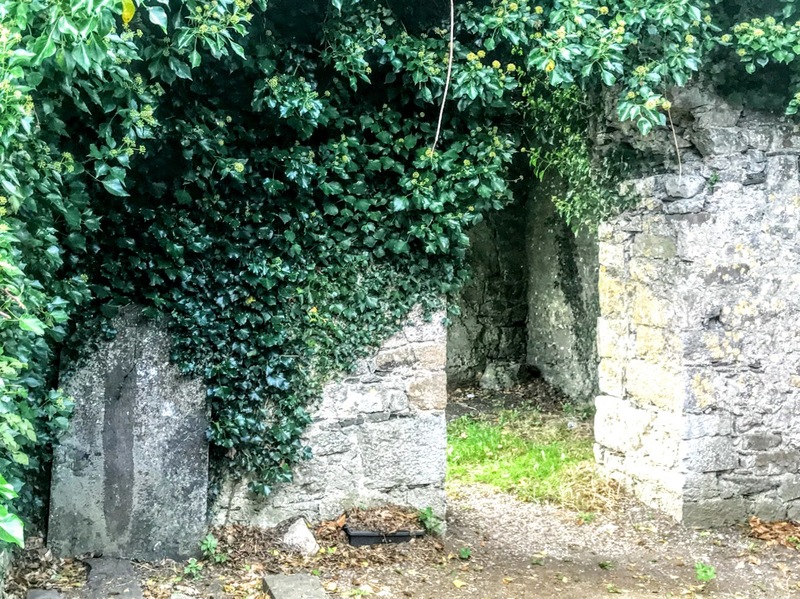 The walls are partially overgrown with ivy, and the interior walls were coated thickly with plaster, although the interior is now overgrown with briars and nettles. The west gable has two central doors, one directly above the other, and there is a window opening in the north wall. All three walls show plaster scars for wooden frames. The top of the west gable still has the stump of a bellcote. Against the outside of the west gable are remains of gabled porch. The area once where the east end of church stood is now filled with 18th and 19th century burial vaults, including one with a classical limestone mausoleum. A flat limestone slab in the north-west corner of the surviving portion of church has the date 1705. The east end of the church is overlain by 18th and 19th century burial vaults, including a classical limestone mausoleum, and there is a scattering of 19th century chest tombs to the south of the church ruins. Today, not enough of church structure survives to date it accurately, although the surviving features may late from the late 17th century date, and the core of church could be late-mediaeval. Saint David’s Well is said to have been in the Castle Demesne, in what was once the Earl of Devon’s pleasure garden. It was said to curie people ‘possessed by the Fairies,’ although there are no other traditions associated with the well, and I was unable to find it during my rambles around the Castle Demesne last weekend. Inside the church ruins, there is a headstone for John Newton, who died on 21 February 1715. But the oldest legible gravestone is that of Elizabeth Brudennell, who died on 13 January 1705, and her husband, who died on 14 January 1709. There may be many older graves whose markers are lost or now illegible. 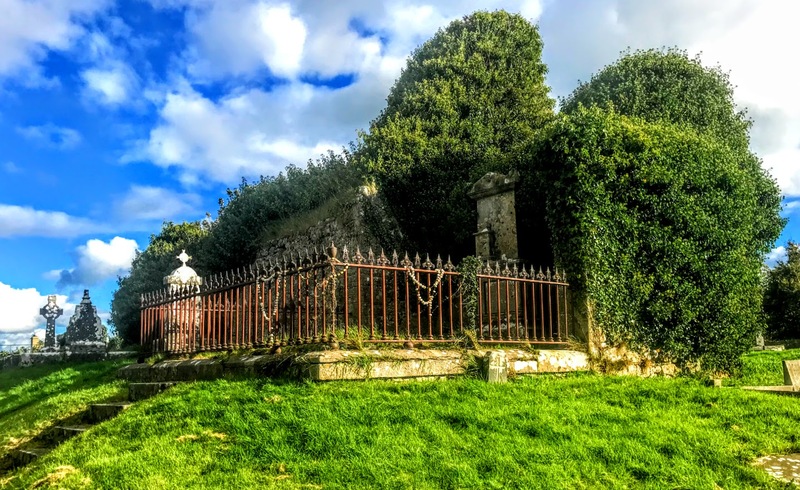 The Curling family, who were the agents of the Courtenay family and the Earls of Devon, proprietors of the Newcastle West castle and estates, are buried here, as well as members of their staff, and members of the Nash family who later owned the castle. Here too is the grave of William Smith of Cahermoyle, near Ardagh, Co Limerick, the grandfather of William Smith O’Brien (1803-1864)) of Cahermoyle House, leader of the Young Ireland revolution in 1848. William Fuller Hartnett (1804-1879) who is also buried here was a prominent nationalist but is remembered in Newcastle West as the man who built ‘Fuller’s Folly,’ immediately south-east of Desmond Castle in Newcastle West. William Fuller Hartnett was a Cork-born linen merchant. His wife died tragically at the age of 40, leaving him with a young family. He was a close political ally of Daniel O’Connell, but later switched his political allegiance to the Young Ireland movement, and was jailed for a few months in 1840 because of his strong radical political views. Although he leased the land beside the castle from the Earl of Devon in 1867 and died in 1879, Fuller’s Folly bears the date 1889. He is buried in Churchtown graveyard. Also buried here are the victims of the Great Famine (1847-1848). A plaque commemorates Paddy Flanagan, who with Jim Quinn found the Ardagh Chalice on 25 September 1868. Other graves include Jackie Pierce, the father of Sophie Pierce (1896-1939), the pioneering aviator from Newcastle West. My vices in the dust are laid. My soul smoke like soars to the blest. However, the inscription on this gravestone is no longer visible.